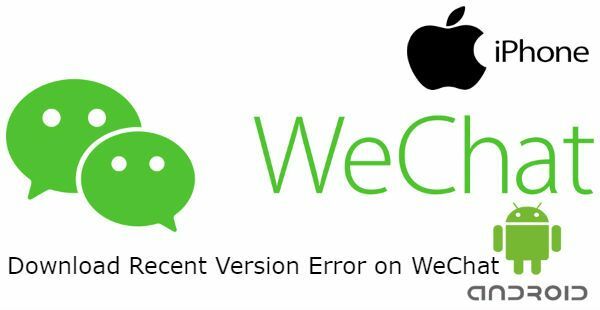 If you are getting download recent version error on WeChat but you have already downloaded the recent version, we will provide solutions for this on here. The problem also appeared in the past with different versions. Such as “request not allowed due to lower version of wechat. Update the latest version of WeChat first” error notification on WeChat. There is one recommended solution of this error and we have provided that on our platforms before. The problem is a known issue of WeChat. There are also many other problems with the current release. We are going to provide the solutions on this page for you. You can visit our community or go to our support page through the end of this article if you have any questions. We will provide some fixes for you below. That won’t take your too much time to fix download recent version error of WeChat application. If you are getting this error for iOS devices, you will need to skip the first step. Firstly close WeChat on your device. Clear data and cache of WeChat. Go to Apps and then Settings. Go to official website of WeChat. Download 42 MB WeChat file. Install it to your device! Why did you enable unknown sources for this process? For downloading and installing applications out of Play store, you will need to enable unknown sources option from your settings. Otherwise your installing process will not work at all. After you installed WeChat and fix your problem with download recent version error, you can disable this option. If a new update takes a place on WeChat, you can always update it from the official source of WeChat or Google Play Store. Reinstalling WeChat is another option for you. If you don’t want to download WeChat from official source. You can uninstall the application and install it from Play Store again. However this solution is not working everytime for download recent version error .